Timings for installation can be discussed, as it may be that work will be produced on site, or produced offsite and installed. Space to produce work may be available depending on the needs. Initial thoughts are that we are looking for pieces designed for the site, rather than already produced pieces. However we don't know what is out there and are very open to suggestions. The type of works are also open to submission. Sculpture, paintings, glass, planting or any other medium or mixed medium would be considered. The only proviso is that we'd like the art to be on display 365 days a year, and so must be capable of dealing with all weathers and be securely fixed to be safe and secure. 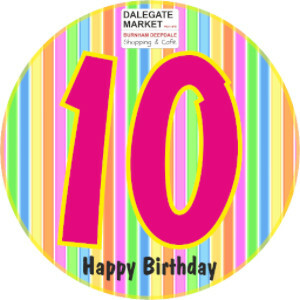 We can happily arrange for you to visit Dalegate Market to have a look around and discuss possible locations. There are walls, roofs, walkways, steps, car parks, pop up shops, seating areas and many other potential spaces. At this stage we are only considering areas within the Dalegate Market area, not the campsite and hostels of Deepdale Farm. We’ll be considering sculpture for those in the future, possibly late 2017.